How you calculated accuracy from just polarities e.g (+0.5, -0.77 etc) and graph where your are mentioning that indico is better ? If possible answer me in detail and quickly ! The ground truth is known and thus we compare how the detected sentiment (polarity) for a tweet matches with the ground truth. For Indico, the range 0.45 to 0.55 is taken as neutral as explained in the blog for calculating the accuracy, i.e. 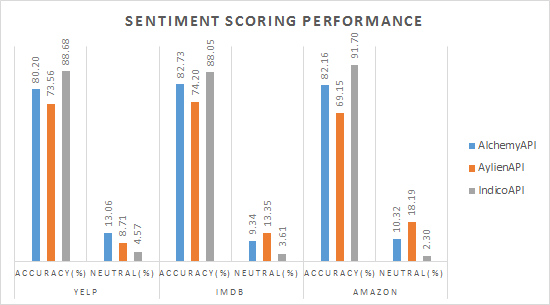 how manty times ground truth sentiment matches with the detected sentiment.